Bring your boat(s)! 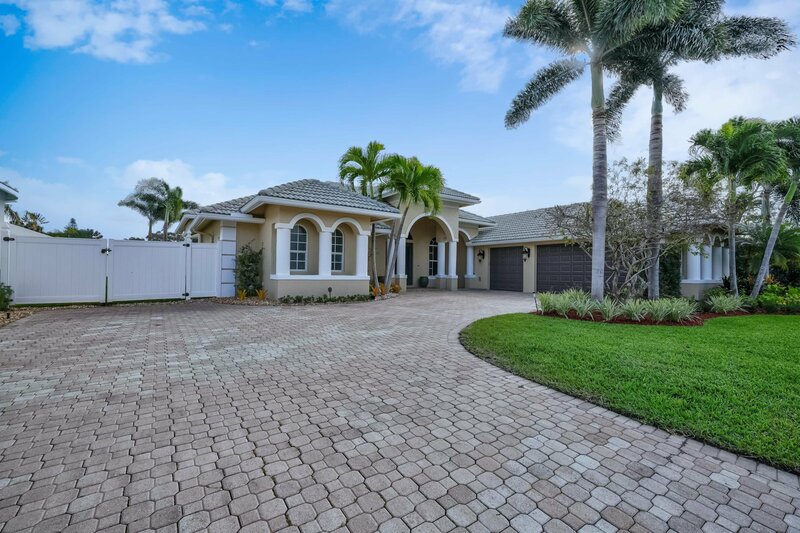 This 4 bed/4 bath/3 car garage 2004 CBS home is at the end of a cul-de-sac, with eastern exposure, on 105 feet of sea wall. Deep water (5 at MLW) and no fixed bridges, dock for 4 boats includes a 40k lb lift in 50 ft slip. Unincorporated PB County = lower taxes. This home has it all 12 ft ceilings, Brazilian mahogany front doors, central vac, 15 KW generator (propane), heated salt water pool and spa and Jandy wifi controls, custom kitchen cabinetry with cook island, GE Monogram appliances, granite counters, plantation shutters, California closets, HUGE master with retreat area, WI shower, his/her vanities and walk in closets. 2 zones AC replaced in 2015 with 1 ONLY for the master. Sit and relax after a day on the boat in the waterside tiki area. Why build at 2X the $? 14208 Harbor Lane 1)	3200 SF under air, 4500 SF Total CBS •	Built in 2004 by Mike Munz Construction for John & Kathy Brandes. •	Built to the 2001 Florida Building Code (FBC) 140 MPH Exp B. 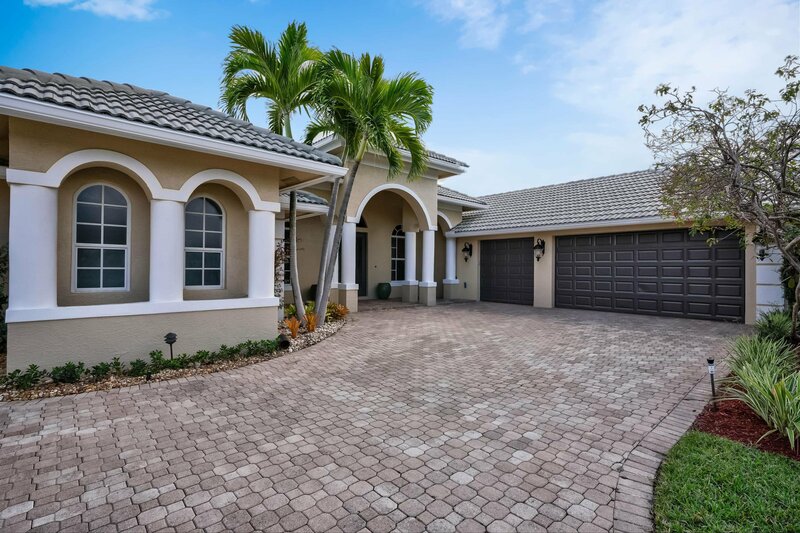 •	Built with full impact rated hurricane panel protection. •	As such the Property receives the best insurance rates. Insurance is $5,888 a year for the typical Home Owners Policy WITH named wind storms coverage. 2)	Flood Zone •	Flood zone is shaded Zone X with a (BFE) Base Flood Elevation = 4' ('88 Datum). The new shaded Zone X is the Old Flood Zone B. For reference, the top of the sea wall is at an elevation = 3' ('88 Datum). Thus, the property gets the 'preferred' rate for flood insurance which is $450/yr. 3)	Taxes ($26,900) •	This property is in unincorporated Palm Beach County so the tax millage rate is lower. By comparison, it's 17.3144 at 14208 Harbor but it's 18.4301 in Jupiter, 19.4566 in PBG and 19.4144 in Juno Beach. Thus, this location will save about 4k a year on a 2M house. 4)	FULL House exterior, walls, trim, gutters and doors were just painted in 2019. 5)	Roof pressure washed and inspected inside and out in 2019 by a licensed roofer and no leaks. 6)	Carpet replaced in all 3 bedrooms and bedroom walls painted in 2019. 7)	2014 - 4 ton Rheem RH1T48 A.H. with Rheem 14AJM49A01 C.U. (installed 2015) 8)	2014 - 2 ton Rheem RH1T24 A.H. with Rheem 14AJM19A01 C.U. (installed 2015) 9)	House has piped in 'city' potable water & on-site septic. The septic tank was pumped and the tank & field system were inspected in 2019. 10)	Gourmet kitchen features a cook island with a vegetable sink and on demand hot water, ¾ HP Garbage Disposal, GE Monogram Refrigerator, Dual GE Monogram wall ovens, GE Monogram warming drawer, (5) burner gas (propane) cook top. 11)	500 lb in-ground Liquid Propane Gas tank feeds the generator, cook top, pool heater, water heater, & clothes dryer. 12)	15 KW propane gas (propane) powered Generac generator with transfer switch was just serviced. This generator runs both the 4 ton & 2 ton AC's as well as both refrigerators and select lights. 13)	Ultra large capacity LG front load clothes washer (WM3250HWA) and gas (propane) dryer (DLEX3250W). 14)	2003 75 Gallon propane gas (propane) American Water Heater with 'constant hot water' circulation pump. 15)	Nutone central vacuum system with kick board sweep location in the kitchen. 16)	Water, sewer and power connection are in place for a future summer kitchen on patio. 17)	Pool with Jacuzzi spa (heater disconnected) with Jandy Aqualink RS controls with wifi connected control unit for pool, spa, heater, lights ect. Hayward Aquarite Goldline salt chlorine generator & baby barrier (in the garage). 18)	105' of seawall built in 2004 on riparian water frontage. 19)	No fixed bridges between this property and the open ocean via the Jupiter Inlet. Both the Indiantown Rd & Donald Ross Bridges are 35' clear when closed. 20)	(1) 45' X 18' wet slip with a 40,000 Lb lift with Tigershark remote control system. 21)	(2) 38' X 18' wet slips with 5' at Mean Low Water. 22)	(1) 38' X 15' wet slip with 5' at Mean Low Water. 23)	18' x 50' fenced boat storage in the side yard. 24)	Zoned sprinkler system with new controls and a Mosquito magician automatic mosquito control unit & low voltage exterior landscape lights. 25)	Water side Tiki hut with power run to it. Listing courtesy of R&R Realty Inc.